Winter is at its peak — the smell of cold, crisp, harsh air reminds us of the scarcity of the dark months. But even in the depths of winter’s darkness, nature offers us healing winter remedies for the season’s ailments. Up above in the canopy of the woods, the boughs of pine (Pinus spp.) sends songs of its healing for the respiratory system into the breeze through the trees. Down below on the forest floor, the garlicky wild chives (Allium vinneal) poke through even the most frozen ground, cold but still carrying that flavorful aromatic of onion. The drying, resinous aromatic pine needles and the stimulating flavors of the green tips of wild chives can be brewed together in a french press or tea pot as a loose tea. This aromatic tea of the pine needles can release stuck mucous in the sinus cavities and can dispel the damp and stagnant lung mucous of winter’s respiratory distresses. The pine needles also adds in a bit of Vitamin C for an extra boost of this needed winter vitamin. Brew handfuls of both pine needles & tips along with handfuls of chives in equal parts hot water for 10 minutes. Sip hot. Because of this tea’s drying nature, juice of lemon and the addition of honey are nice to add a soothing, coating element to the tea. Also from the woods, wild cherry bark (Prunus serotina) can be added to help quell an unproductive spasmodic cough to be more productive in eliminating congestion. 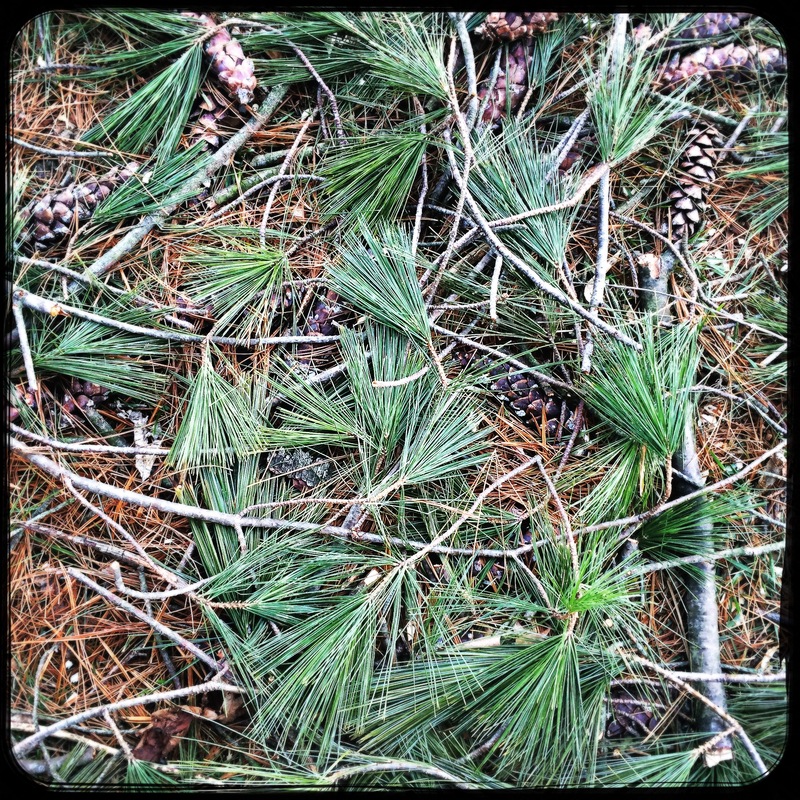 For sustainable gathering, collect fallen boughs and branches of the pine after strong winds have passed through the woods. The needles can be stripped from the boughs and used fresh for later use. Clip the tops of the chives as they are perennial and will regrow as the sunlight returns to the forest. The aroma of the simmering pine on the stovetop can also clear the air of stagnant winter ick that can collect inside the home. Simmer pine tips and needles on the stove, releasing the aromatic oils into the air. This brew can also be used as a steam inhalation by putting a few handfuls of the plants into a steaming pot. Remove from the stove and cover your head with a towel to help open the most stuck of sinuses.